The semester is now over and I am reflecting on my iPad course, as well as looking through some of my anonymous comments from students. I have yet to get my actual course evaluations but I did have students volunteer to complete an exit survey on their experience of learning with the iPad. I will share a few tidbits as I am hoping to get this written up and submitted for publication. I have a previous post about my initial thoughts on learning with the iPad, which you can find here. I also wrote up a post about an iPad specific assignment that I created for the course, which you can find here. In the previous iPad blog post I shared that I was excited for my class to have the iPads for learning. I was also realistic in regards to knowing the literature and using new technology in the classroom. Some have argued that students today are more adept at using technology than their instructors. However, as Apostolos Koutropoulos points out in his Digital Natives: Ten Years After article, this is more myth than reality. My final thoughts on the iPad in my Policy course are probably best viewed with an eye of skepticism. I am a technology geek and love using Tech in the classroom. Especially a Policy course since most social work students dread policy. I say skepticism only because the reactions to the ipad were fairly mixed. Most students indicated that the iPad was very helpful for learning because they were able to search for information in real-time. If a student had a question on a Policy that I couldn’t answer, we searched the Internet and had a discussion about what we found. Students loved the fact that they could work on their group projects remotely and at various times. Students also indicated they liked being able to access course information easily and contact me as their instructor through email or twitter. Yes I used Twitter in this class, which could be another blog post in and of itself. On the other hand, some students indicated that the iPads were a huge distraction during class. Although many students initially were using their iPads to take notes, some indicated they often would get distracted playing games or going on Facebook. I too was frustrated with this aspect of the iPad, as I indicated in my previous post. I also noticed that students began to revert to their laptops and other technological tools towards the end of the semester. When I asked why, they indicated that it was easier to type on the Laptop and that the Laptop seemed to be more reliable. I think that because students also were given the iPad MINI that it was more difficult for them to type on the smaller screen. My FINAL THOUGHTS on the iPad are that I really enjoyed having the iPads in the class most of the time. I think that as anyone adopts a new innovation that there will be a learning curve associated with it and that one should think critically about how to incorporate new learning tools in their classroom. This is something I have been researching, writing about, and discussing with many others for years now. The need to think about how to incorporate new tools rather than just adopting them because they seem innovative. I was lucky that I was able to get the iPads in my classroom. However, it was on such a short notice that I know I could have done a better job with assignments and class activities that utilize the iPad if I had more time to think about it. To sum it up, would I use iPads in my Policy course again. YES!!! Am I going to use the iPads again next semester? NO!!! 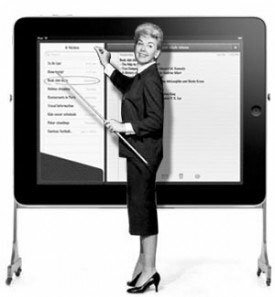 Fortunately or perhaps unfortunately for the Policy students… I have requested that the iPads be taken from my Policy course and be issued to the students in a new course I just developed here at UNK. The course is titled Social Media, Digital Activism, and eCitizenship. The course draws upon an interdisciplinary perspective of marketing, nonprofits, and advocacy. It also relies heavily on New Media Literacy and of course Social Media. I will try to blog about it later. At any rate, I am glad that the University is innovative and forward thinking enough to invest in new technology and allow faculty to experiment. I hope that we will continue to be able to do so but with an eye towards making the learning experience better. I know that in social work we need more exposure to technology and to keep an open mind about how technology impacts our profession, our clients lives, and education. After all, it’s not going away! This type of social work supervision focuses on the task of enhancing a social worker’s job performance. Ensuring that a social worker is equipped with the necessary skills to do their job more effectively can also help them develop a sense of ease when doing certain aspects of their jobs. We should remember the importance of supervision. From the time a student begins interning to on-the-job practice, proper social work supervision not only ensures that clients are treated correctly, but also seeks to develop and enhance the skills of each social worker.